Mountain Biking is a fast way to see rural Nepal. Nepal's extraordinary contours and numerous tracks and trails make it an ideal place for mountain biking. You not only climb up and down challenging mountain roads but also have wonderful opportunity to admire the magnificent scenery around. You can ride through rice fields, bike to the Terai towns or test your mountain biking skills by travelling to Mount Mera with your bike. The mountain biking possibilities and streets are "endless" in Nepal. 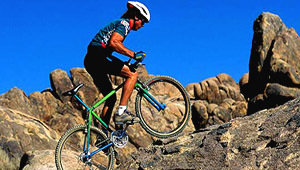 There are many mountain mud tracks that have created a paradise for the action biker. A classic off-road adventure is the 70-km Scar Road that starts from Balaju to the west of Kathmandu city, traverses the hill resort of Kakani, Trisuli bazaar and Shivapuri, and then descends back to Kathmandu. Another route is the two-day circular tour to Dhulikhel to the east of Kathmandu. You can combine this ride with a visit to the ancient townships of Bhaktapur, Namobuddha and Panauti which lie en route. Yet another possibility is the 75-km ride on the adventurous, hair-raising Tribhuvan Highway to the hill resort of' Daman southeast of Kathmandu that offer even tougher challenges.